1” BSP 3 way Female to Male cross connector with sealing O-rings. Features 3 Female Swivel connectors and 1 Male Swivel connection. 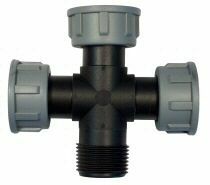 1" BSP Female x 1" BSP Female x 1" BSP Female x 1" BSP Male Fittings.